The well-known Barbour Chelsea Jacket for men has been reinvented for their Spring Summer 2013 range, and now comes in a fitted ladies style: the Barbour Ladies Chelsea Quilt. This jacket is made from 100% polyamide, known for its hard-wearing properties, with a 100% polyamide lining. To give it that fitted, feminine, look there are adjustable waist tabs at the back which allows you to draw the jacket in and best of all, because it’s a quilted jacket it is machine washable. Available from Philip Morris & Son in a choice of 3 colours: Black and Turf, Ocean and Navy (pictured), and Navy and Pearl, these jackets have a contrasting colour lining to the outer. As well as two front pockets, there is a zipped pocket on the outside as well as one inner zipped pocket. With a classic Barbour two-way zip, the Barbour Ladies Chelsea Quilt is lightweight, which is perfect for warm summer days leading into cooler evenings. 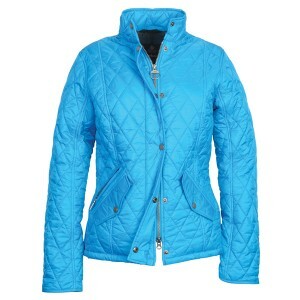 barbour, Barbour Chelsea, Barbour Chelsea ladies, Barbour Ladies Chelsea Quilt, Barbour ladies jacket, Barbour ladies quilt, Quilted jacket. Bookmark.